Burgess tell me of another $1 million price cut on Oceanco's 51.4m motor yacht Lazy Z, a joint listing with Merle Wood at Merle Wood & Associates. Built in 1997, Lazy Z has benefited from the care and attention of a highly experienced captain and crew. She recently completed a $4 million refit that included exterior paint and teak deck work, interior decor, installation of Quantum zero speed stabilisers, 15 year Lloyds Class inspections and survey, and a complete service of all mechanical, plumbing and piping systems. 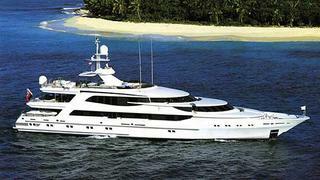 Lazy Z provides accommodation for 12 guests in 6 cabins. The full beam Owner's suite is located on the main deck and has its own private observation lounge with 180 degree views and can be used as a private study, breakfast area, or a cosy lounging space. Five exceptionally generous guest staterooms, each with private en suite baths, take up the lower deck and include three king staterooms, one double with a Pullman berth, and one twin cabin. In addition, a fully equipped gymnasium is easily accessible to all staterooms on the lower deck. On display at the Monaco Yacht Show, Lazy Z is now asking $18,999,999.